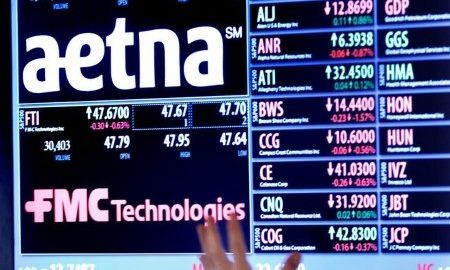 CONNECTICUT (Reuters) – US health insurer Aetna Inc, which is said to be in talks to be bought by CVS Health, reported a higher-than-expected quarterly profit on Tuesday as it kept its costs in control and cut losses in its pared down Obamacare business. Shares of Aetna, which also raised its full-year earnings forecast, were up 1 percent in light premarket trading. Pharmacy operator CVS Health Corp has made an offer to buy Aetna for more than $200 per share, or over $66 billion, Reuters reported on Thursday. A deal would enable Aetna to take back full control of prescription medicines for its customers by negotiating prices with drugmakers and setting customer out-of-pocket costs for each drug. The company said on Tuesday its net income rose 39 percent to $838 million. But revenue dipped 5 percent to about $15 billion, partly due to its reduced presence in the Obamacare business. The company has joined other large health insurers including UnitedHealth Group Inc and Humana Inc in pulling out of most of the government-subsidized individual health insurance market. Aetna will exit the market fully in 2018. The health insurer said its medical benefit ratio – the percent of premiums spent on claims – fell to 81.4 percent in its commercial business from 83.8 percent a year earlier. The drop was due to lower losses in its Obamacare business and improved performance across its core commercial business, the company said. Excluding items, Aetna earned $2.45 per share, beating analysts’ average estimate of $2.09, according to Thomson Reuters I/B/E/S.